Dan Quinn doesn’t want to make the soldier’s name public, because the soldier himself doesn’t want that. But even without the name attached, his story (which has been confirmed) is worth telling, especially on the week of Independence Day. It might be the best way to honor the soldier’s impact on Quinn’s Falcons. Quinn met him through his Quinn’s Corps program a few years back, and the Army cavalry specialist explained what happened to him while he was deployed in Afghanistan. A buddy of his had been killed two days earlier. Determined to avenge him, and knowing where the assailants were, the soldier sought retribution on enemy territory. But as he was entering the house where his friend died, on hostile turf, the soldier’s emotions betrayed what he was taught. The lesson he learned that day, when he was injured by an IED, resonated with Quinn. Football players are not soldiers. Games are not war. But the correlation that Quinn could draw between the makeup of a soldier and what pro football players need to do to succeed—he was still in Seattle, as defensive coordinator, at the time—was impossible to miss. This soldier felt a deep loyalty and connection to his teammates. He had their back, even in the worst circumstances. And in the end, that was important, but so too was a soldier’s ability to channel emotion and adhere to his training under the most adverse and pressure-packed situations. It was then that Quinn knew that whenever he got his shot at being a head coach, the military would become a part of his program. In Atlanta, it has. And two days before the Fourth of July, we thought this would be a good time to explain how, at this strange time in the NFL when the pregame singing of the national anthem has become a political battleground, Quinn has made that count for his team. In this holiday edition of the MMQB, we’re going to check in with Chip Kelly 18 months after his run as NFL coach concluded, explain why the Jaguars are optimistic with where Blake Bortles is, and break down the supplemental draft class that will enter the league on July 11. But we’re going to start with Quinn and the Falcons, and where the NFL’s most military-connected team stands in the bizarre landscape of 2018. And that means explaining, first, how Quinn has handled the balancing act that most coaches never thought they’d have to worry about: the philosophical differences that exist in every locker room over the playing of the national anthem. “You know what was cool?” Quinn said. “Back in November, the team got together and said, ‘How do we go from where we are and go make a difference?’ I was proud to be part of this group this spring. We took action on nine different initiatives in the offseason, one a week, that we wanted to take on as a team. And so what we did in the offseason was take on some of the issues that were really important to players. “A lot of that involved the team’s influence and the police side of things, so we dove head-first into those two things with ridealongs, and trips to boys and girls clubs, a lot of things back-and-forth with the police and the community. So that’s really what we decided on as a team. It was easier, too, because of the attachment the Falcons have had to the military, and the fulfillment of Quinn’s plan to build its principles into his program. The idea crystallized with the story of the injured soldier, but that was neither the beginning nor the end for the coach. Quinn’s father-in-law, Larry Haines, was in the Navy, and a number of his college buddies served too. He says now that if not for coaching, there’s a good chance that would’ve been his life too. And so he’s always kept a connection there, and that was the impetus to launch Quinn’s Corps in 2009 in Seattle, when he was the D-line coach. He took it with him to the University of Florida, back to Seattle and then to Atlanta. Quinn and GM Thomas Dimitroff had just finished informing a rookie of his release after Quinn’s first season, and Quinn overheard this particular player running into a now ex-teammate on his way out the door after cleaning out his locker. So knowing his desire to incorporate military ideals, Dimitroff and trainer Marty Lauzon suggested to Quinn bringing in Acumen Performance Group, run by ex-Navy Seals who apply their training methods to train in both the corporate and athletic arena. Quinn knew the Miami Heat worked with those guys, and with coach Erik Spoelstra signing off on the experience, the Falcons started with APG in 2016. The lessons were pretty similar to ones that Quinn took from his military friend wounded in battle: Being accountable to one another was vital, as was adhering to what you’ve been taught in the harshest of circumstances. Accordingly, Atlanta broke through that year, reaching the Super Bowl. But the training experience might have been even more valuable after that last game didn’t go to plan. By then, the APG folks had put Falcons players through a process of writing their own standard operating procedures and code of conduct. Sure enough, sticking to that foundation got the team through the hangover—and a rocky start to 2017. The veterans are capable teachers because they’ve seen the value in it, through APG and Quinn’s Corps and USO and also the TAPS program (an organization that provides support for those grieving the loss of a member of the armed forces), which they work with for a game and, like Quinn’s Corps and APG, involves the whole group. 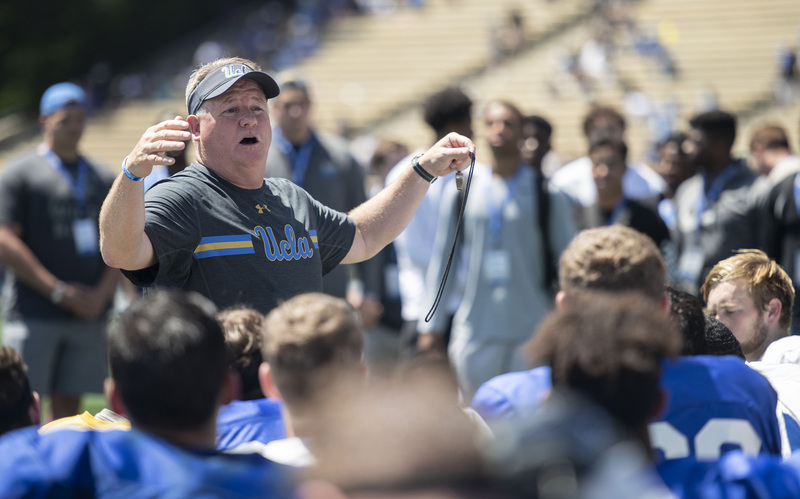 Last weekend I asked Chip Kelly if being back in college football and the Pac-12 with UCLA feels like riding a bike. His answer was, if you know him, pretty much what you’d expect. For a minute, though, Kelly and I did take look back at his NFL run, which was better than you might remember. In his first year after coming from Oregon, his Eagles went 10-6, and Nick Foles made the Pro Bowl with a 27-to-2 TD/INT ratio. Over three seasons under Kelly, Philly ranked third in points per game and total offense. And even his single year with the Niners saw improvement in Colin Kaepernick’s play and the run game’s numbers. On the Eagles keeping some of his schematic elements in place. Kelly’s not interested in taking credit now, but it’s a point that more than a few coaches and scouts have made to me in the months since the Eagles won it all. “I don’t really look at it like that,” Kelly said. “The other part of this is none of us were in the room with Amos Alonzo Stagg and Knute Rockne when this game started, so we all stole it from someone else. Who cares where it came from? We didn’t get into coaching so everyone would say, ‘We run plays or implement things so everybody will say I invented this.’ I mean, if you think you invented it, you’re kinda full of crap. Kelly, by the way, just explained the run-pass option. But what Pederson’s staff did impressed him. Remember, Kelly knows a lot of Philly’s personnel. He coached Foles. He evaluated Carson Wentz with the Niners, and might have taken him at 7 if he’d fallen there in the ’16 draft. And so he can grasp what they pulled off. “They transitioned quickly to Nick’s strengths, which, there’s a lot of them,” he said. “But they’re different than Carson’s. Not totally different, you’re not talking apples to oranges. They still ran their base stuff that they ran, but they did certain things, they probably ran Carson a little bit more, they throw more RPOs with Nick, but Carson could run RPOs and Nick could run a little bit. Kelly stays connected. As you can tell, watching is one way Kelly stays connected to the league. Another has been in the kind of information sharing we discussed last week with Lincoln Riley—working with guys from Rams coach Sean McVay to his old Eagles line coach Jeff Stoutland, to the guy he’s done off-the-books work with since he was at New Hampshire, Patriots coach Bill Belichick. And he learned a lot during his time in the NFL. As much he gave to the league, he also took plenty that he believes will make him a better college coach than the one who left Oregon in January 2013. His Bruins, for example, do more situational work than his Ducks ever did, which is a result of the impression the NFL left on him. “In the NFL, the game is a lot more situational, just because the games are so close,” Kelly said. “You have to be great at the end of the half. A lot of times in college, it’s 28-0 at the half and you’re not really in a two-minute situation. In the NFL, games are so much closer that situational play just comes up more often. That’s what a lot of games come down to. “There’s a channel dedicated to it, the Red Zone Channel. It’s dedicated to how critical those situations are. And when the Red Zone Channel is really buzzing is at the end of the 1 o’clock games going into the 4 o’clock games because there’s eight of them that are within a touchdown of each other, and you need a critical stop or a critical conversion to keep things going. It should be fun to see Kelly put this to work on Saturdays in the fall. And he’ll have his own fun keeping an eye on what’s happening on Sundays. The NFL’s supplemental draft is usually a pretty boring affair—pass, pass, pass, pass, zzzzz… But it might be worth a little more of your attention this year than it has been in the past. Over the last five years, only one player has been selected in the supplemental draft: Isaiah Battle, by the Rams in 2015. He has spent the three years since on the fringes of the league, and he’ll be in camp with the Seahawks this summer, looking for a job and still looking for his first NFL start. Before that you had Josh Gordon taken in the second round in 2012 and Terrelle Pryor in the third round in 2011. This year, five guys are in. 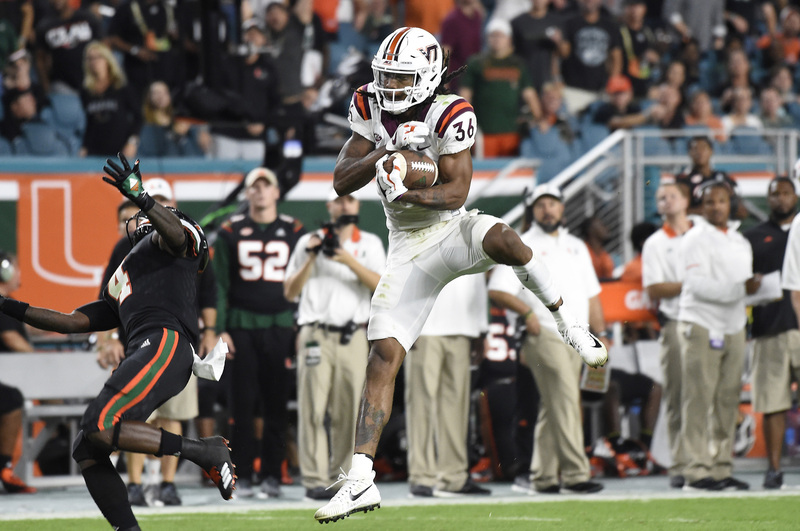 Virginia Tech CB Adonis Alexander, Western Michigan CB Sam Beal and Mississippi State S Brandon Bryant had academic issues that led to their departures from school. Oregon State LB Bright Ugwoegbu, suspended since before spring practice, was entered into the mix last week. And Grand Valley State RB Marty Carter’s name popped up on the wire, to the surprise of many, on Friday. In case you don’t know how the supplemental draft works, it’s basically a silent auction. Teams put in bids, and the high bid gets the player. And if you get the player, you give up the corresponding pick in the 2019 draft. So if a team takes Alexander in, say, the third round, then their slotted third-rounder next year is vacated—which is usually enough to get teams to stay away from taking anyone. Sam Beal, CB, Western Michigan: He’s tall, long and talented, if a little slight. “He’s the more talented cover guy [compared to Alexander],” said an AFC scouting director. “A pure cover guy, fits a lot of schemes. He’s a skinny dude, and even though he presses well, you look at his body, how well does he project? … He’s not a bad guy, just kind of a knucklehead, the kind who’ll wear the wrong color socks or miss curfew or have parking tickets and not pay them off.” Beal played really well against USC last year—picking off Sam Darnold—and that tape has shown scouts there’s a lot to work with here, if he grows up and fills out a little. Bright Ugwoegbu, LB, Oregon State: Ugwoegbu has started for parts of the last three years, and he’s been fairly productive. But a couple high-level personnel people I hit up the last few days intimated that there’s no chance he’ll be drafted. His workout numbers would seem to back up that assessment. NFL.com’s Gil Brandt tweeted them out—at his pro day, Ugwoegbu came in a shade under 6' 1" and at 205 pounds, and ran one 40 in the 4.9s, and another just over 5.0. That’s safety size, with defensive tackle speed. Martayveus Carter, RB, Grand Valley State: Another academic casualty, Carter was a Division II All-America as a sophomore, rushing for 1,908 yards and 20 touchdowns. Last year he wasn’t as prolific, with 931 yards and nine rushing touchdowns in nine games. The school’s all-time leading rusher, he was held out of spring and then, more recently, declared ineligible. There’s talent there—Carter was at one point expected to go to Northern Illinois—but while he has nice feet and quickness, he’s probably not big enough to break tackles and run inside consistently in the NFL. He’d likely have gone undrafted in April had he declared, so he almost certainly won’t be taken on July 11. I love Raiders owner Mark Davis getting on the ground and serving lunch to the stadium workers in Vegas. But yeah … this is pretty good. Right up there with the conversion van and mornings at PF Chang’s. Now batting ... No. 13 ... Odell Beckham Jr ... No. 13. Giants WR Odell Beckham Jr. was once offered a contract by the Rockland Boulders of the Can-Am League—yes, it was a publicity stunt—based on his performance in a celebrity softball game. To me, this one’s actually pretty freaking impressive. Beckham was a star football and basketball player, and track athlete in high school, and he was a decorated youth soccer player before that. I couldn’t find much evidence of the last time he played competitive baseball. And yet, he gets in the batter’s box at Yankee Stadium and can crank one over the left-field wall cold. It reminds of being at a golf tournament with Von Miller a few years ago. He had barely played before. And after a couple swings, he was absolutely ripping it off the tee. Some people are just made different than the rest of us. President Donald Trump’s declaration this week at a rally in North Dakota is just the latest proof that there’s nothing the NFL can do to separate from the political war taking place in America. He’s identified the NFL as a touchstone to ignite his base, and so it makes sense for him, looking forward to the midterms and 2020, to use the league to keep his voters engaged. Interesting nugget on that: I was told that the owners purposefully avoided using his name—just referring to him as “the President”—in their privileged session at the Atlanta meeting in May. I don’t know if this qualifies as a meme. Whatever. How the hell is this kid 15? Patriots owner Robert Kraft for giving to a very worthy cause, with his donation to Team Super Bowlen this week, as part of the 2018 Walk to End Alzheimer’s. Broncos owner Pat Bowlen has been battling the disease, and his wife, Annabel, announced a few days ago that she’s been diagnosed with it too. The two owners walked a similar path—first Bowlen, then Kraft came to prominence in league circles by chairing the broadcast committee. And Kraft has said in the past how helpful Bowlen was in helping him along after he bought the Patriots in 1994. “He was always a league guy first,” Kraft told the Boston Globe in 2014. “He was a real solid partner, one I respected and had a lot of fun with. Just a real good guy.” Denver president Joe Ellis and Kraft communicated via email last week to set it up, and I’m told Bowlen’s daughter Brittany called Kraft on Friday to thank him on behalf of her siblings for a gesture that they saw as very heartfelt and genuine. 1. Good for Kam Chancellor, walking away from football, presumably (per his twitter account) on his own accord. If you want an idea of what goes into a decision like that, read our mailbag lead with ex-Bills center Eric Wood from mid-June. He, like Chancellor, was told continuing to play could lead to paralysis. And if this is it for the Seahawks enforcer, here’s hoping he gets the credit for what he was—the heart and soul of a championship defense. Anyone in that locker room would tell you he was the ultimate alpha among a group stocked with those types. And Chancellor should always be remembered in Seahawks lore for making the play that set the tone in Super Bowl XLVIII. His de-cleating of Demaryius Thomas in the first quarter of Seattle’s blowout win established that Denver’s receivers would pay a price for working the middle of the field, which altered how the game would be played for Peyton Manning’s high-flying offense. 2. We’re going to have Draft Week at The MMQB in a couple weeks, and as part of that I looked at next year’s quarterback class, and talked in depth with ex-NFL QBs Trent Dilfer and Jordan Palmer about the 2019 group, since they’ve been working with some of them. And one thing Dilfer, the head coach at Elite 11, said to me stuck out: The position is healthier than it’s ever been. “Two straight years, we’ve had 48 kids at the [Elite 11] finals, and then 24 at The Opening, who throw the ball better and know more football than any class I’ve ever seen,” he said. 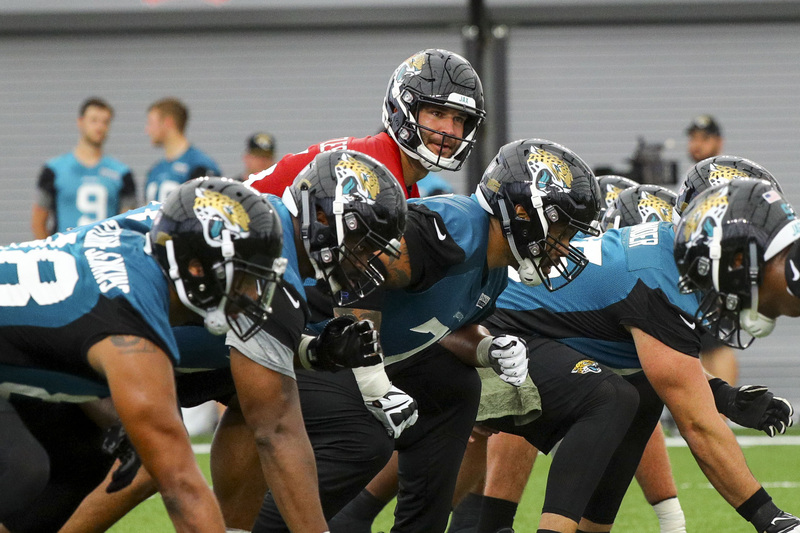 “And I say this all the time—you could put them in an NFL training camp tomorrow, and have them run one-on-ones, routes on air and maybe even some remedial 7-on-7, where it’s not complicated looks, and they’re gonna look like NFL quarterbacks. They’re gonna throw the football like NFL quarterbacks. Now, I’m not saying they’re NFL quarterbacks. But if you didn’t know anything about them, no numbers on guys, and you just walked out and I put Trevor Lawrence or Justin Fields or Bo Nix out there, and no numbers, you put helmets on them so you couldn’t see their face. And they’re next to Alex Smith and Kirk Cousins and Jared Goff, whoever—I was telling Sean McVay this a couple weeks ago—and you just watched them throw, you’d go, ‘Yeah, you got a bunch of good quarterbacks on this team.’ And if I asked, ‘Which one’s 17?’ Most people wouldn’t be able to tell you. 3. The Vikings came into the offseason with four core players going into contract years: LB Eric Kendricks, DE Danielle Hunter, LB Anthony Barr and WR Stefon Diggs. And so good on them for having two of the four—Hunter and Kendricks—signed to very reasonable contracts before the end of June. Diggs and Barr could be trickier. All receiver deals have been complicated, to a degree, by the three-year, $48 million contract Sammy Watkins got in K.C. Barr, meanwhile, is difficult to value financially as a hybrid linebacker who’s become central to what Mike Zimmer and company do. 4. It’s fair to question whether the NFL should be settling cases like it did with Bucs quarterback Jameis Winston, but it’s abundantly clear why both sides worked to get there. For the NFL, the idea of spending another year-plus in a legal fight with a prominent player, like it did with Tom Brady and Ezekiel Elliott, wasn’t very appealing. For Winston, it wasn’t either—not with Tampa Bay looking at having to make a $20.922 million decision on his fifth-year option in about eight months. If you’ve been following these things of late, you know cooperation has its privileges. That’s just the reality of it. With Jameis Winston Settlement, NFL Undermines Its Own Policy. Again. 5. While we’re there, this is why it’s worth paying attention to the character flags players carry when they’re coming out of school. What happened with Winston in March 2016 in that Uber in Scottsdale, Ariz., would hardly be classified as out of nowhere, considering his résumé at Florida State. And there are plenty of other cases of NFL players finding themselves in the same kinds of trouble they got into on campus. I know some people don’t like hearing that teams might be worried about this guy or that guy off the field as he enters the draft. But if you actually look, you’d find that it’s not rare for such concerns to wind up being valid. 6. Consider me stunned at the lack of attention given to the Janoris Jenkins situation (and maybe I’m guilty too, not having it higher in the column). There was a dead body found in the house of the fourth-highest paid player on the New York Giants’ roster, one who made a Pro Bowl two years ago. And Jenkins’s brother has been charged. 7. I think it’s worth paying attention to the University of Texas/Texas Tribune Poll of last week, which showed that only 27% of registered voters polled in that state had a favorable opinion of the NFL. Those sorts of numbers don’t just affect ratings, they can affect sponsorships and partnerships that teams have established, and they certainly bring color to Jerry Jones’s aggressiveness on the handling of the national anthem rules. My sense is this was always way more about business than ideology for him. 8. Good luck to new NFL EVP of communications and public affairs Jocelyn Moore. The role is an important one. And she’s following two very bright guys, in Joe Lockhart and Paul Hicks, whose departures serve as a good indication for how challenging the role is. 9. Next time you hear from me in this space, the July 16 deadline to sign franchise-tagged players to extensions will have come and gone. Predictions? These are tough. I’d expect the Rams to make an effort to get Lamarcus Joyner signed, and the depressed safety market and manageable tag number could help them get it done. Things have been quiet in regard to Cowboys DE Demarcus Lawrence, but I think Dallas will take a late stab at finding a compromise. The cases of Le’Veon Bell in Pittsburgh and Ziggy Ansah in Detroit are more challenging. We covered this, by the way, in last week’s mailbag, explaining why each could be tempted to follow the Kirk Cousins model. We’ll see if they decide to. 10. Want some uniform news? The NFL is relaxing its policy so that teams will now be able to wear their alternates/throwbacks or color rush jerseys on three occasions during the season. It used to be that teams could only wear the former twice, but this gives teams the option to wear them three times. The upshot? The Rams will probably wear the blue-and-yellow throwbacks three times, and should be able to avoid wearing the mismatched blue-and-gold jerseys with the white-horned helmets. 1. The Spurs should play God with the Lakers. LeBron James turns 34 in December. What he’s doing as an NBA superstar, from a career minutes perspective, is already unprecedented. That he’ll remain at this level beyond 2018-19 is no given. So the time for L.A. is now. And RC Buford and Gregg Popovich should deal with Magic Johnson and company accordingly. Hold the Lakers at gunpoint. If they want Kawhi Leonard, the Spurs need to make it hurt. 3. Tim Tebow is a Double-A All-Star because of course he’s a Double-A All-Star. Going into the weekend, his .733 OPS for the Binghamton Rumble Ponies (that’s actually the team name) is 35th in the Eastern League, and he was hitting .261 with five homers and 30 RBIs. So at the very least, it’s hard to call his run at pro baseball a joke anymore. 4. S/O also to Mark Mravic, executive editor of The MMQB, who was fielding “so if this happens, then that means what?” texts from me all week on the end of the group stage of the World Cup. The Fair Play tiebreaker still makes no sense. There’s a whole lot of nothing going on this week in the NFL, particularly with the Jerry Richardson and Winston cases off the league’s ledger. One to watch: A decision could come on Julian Edelman’s appeal. And accordingly, I’m out too—on Nantucket all this week and next week. You’ll still have the column, just not from me. Jenny Vrentas is on it next week, Robert Klemko on July 16, and I’ll be back on the 23rd, live from the start of training camp. While we’re here, I appreciate the feedback I’ve gotten from you guys through my first five weeks in this space. You can keep that coming at talkback@themmqb.com. Happy Fourth, and I’ll see ya in a couple weeks.